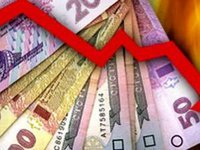 The forex rate of the hryvnia against the U.S. dollar on the interbank forex market plunged to UAH 27.765 from UAH 27.505 per U.S. dollar on the previous trading day, dealers of commercial banks told Interfax-Ukraine. Quotations by the end of trading were UAH 27.75-27.78 per U.S. dollar. The Central Bank's reference forex rate fell to UAH 27.6377 per U.S. dollar on Thursday from UAH 27.4472 per U.S. dollar on Wednesday.